Eventually, most climbing skin glue gets tired. When that happens, it doesn’t stick to your ski very well, and it becomes too tacky and leaves glue residue on your ski. You can fix this problem in 5 minutes. 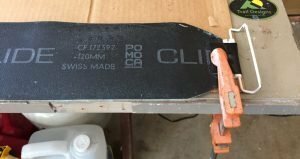 My Pomoca Climb Pro Mohair Climbing Skin glue turned bad after about 44 days of skiing. By bad I mean the skin glue starts leaving skin glue residue on the ski, even if I just waxed the ski. 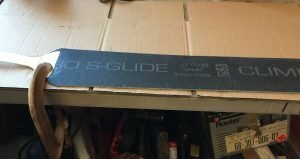 The skin glue residue causes your ski to glide poorly, especially in a track. Glue failure after 44 days seems a bit premature to me, but maybe it depends more on how many times you pull the skins apart than how many days you use the skins. For example, most of the runs I do in the Tetons are 1000′ or less. As a result, I might do 4 laps and have to put skins on 4 times in one day. Also, when the skin glue turns bad, it does not stick well to the ski. The skin edges start to curl and then snow gets under the curling edges, and it’s a descending cycle of poor adhesion. Luckily, you can fix this problem in about 5 minutes. I ironed both my skins and let them cool overnight at room temperature. The next day I went skiing and my skins were rejuvenated! I have used the skins 4 times since I ironed them and the glue is holding up well. They are easier to pull apart. They are easier to pull off the ski. They didn’t leave any skin glue residue on the ski. They stick better to the ski. 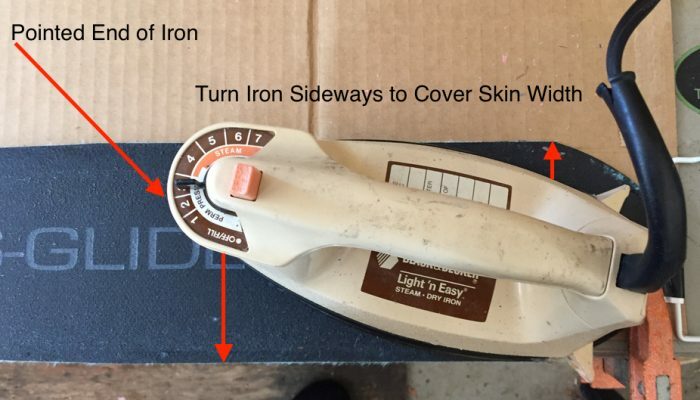 In order to fix climbing skin glue, you’ll need an iron. I don’t recommend that you use your waxing iron because I doubt that you can get all the skin glue off the iron after the procedure. It’s best to have an iron dedicated to skin glue rejuvenation. You can get a cheap iron on Amazon for $12- $20. That’s about the same price as Black Diamond Skin glue. Workbench – Don’t even think about using your kitchen table unless you’re a single male living solo. Place a piece of cardboard on your workbench. If you have a center strip covering the glue, remove it. You can usually peel it off without completely destroying it, but if you do, you can get another one from Black Diamond. Clamp both ends of the skin to the workbench with the sticky side up. I ironed my skins without the clamps, but it’s easier with them. Note: Iron one skin at a time. Heat your iron on the Medium setting. If it smokes when you start ironing, then turn it down a bit. Starting at either end of the skin, hold the iron lightly on the skin until the glue starts to melt, and then move it slowly toward the other end. When I say slowly, I mean slow enough to melt the glue. You’ll know the glue is melted if it’s shiny and smooth. Make sure to point the pointed end of the iron in the direction you are moving. Pushing the back end of the iron tends to push globs of glue off the skin. Once you have melted the glue along the complete length of the skin, look for any glue that is not shiny. If you find some, heat it until it melts. That’s it. Your skins should be rejuvenated. I will report back on how long the rejuvenation lasts. Also, I assume you can iron your skins more than once before having to completely replace the glue.